This section is accessible by selecting a step or introduction node in the Content section. Type Combo Box Help Link Type Select <none> to remove a help link from a step or introduction. Consequently, the Value input field will no longer be visible. Select Help Context ID to make the Value input field visible right under this field and ready to accept a help context ID as input. Value Text Help Document Link Value or Help Context ID Value If Help Context ID is selected in the Type field, specify a valid help context ID in this field to add a help link to a step or introduction. In the Cheat Sheet view, clicking on a step or introduction's help link created using a help context ID will open that help context ID in the Help view. If Help Document Link is selected in the Type field, specify a valid help document link in this field to add a help link to a step or introduction. 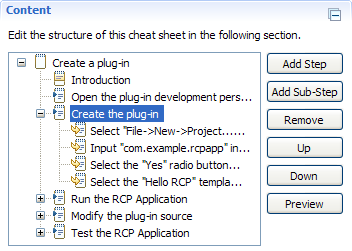 In the Cheat Sheet view, clicking on a step or introduction's help link created using a help document link will open that help document link in the Help Infocenter. Example of a help link removed from a step or introduction. Note: This section is collapsed by default when no help context ID or help document link is specified. Example of a help link added to a step or introduction defined using a help context ID as input. Note: This section is expanded by default when a help context ID is specified. 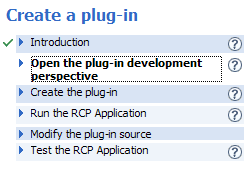 Example of a help link added to a step or introduction defined using a help document link as input. Note: This section is expanded by default when a help document link is specified. Note: A help link created using a help context ID is indistinguishable from one created using a help document link in the Cheat Sheet view.